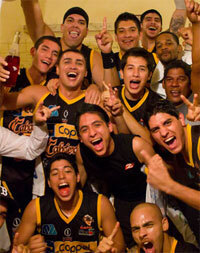 Culiacan blasted Cananea with perfect 4-0 in the Finals winning the CIBACOPA title for season 2009/10. In Game Four, which was played last night, Culiacan had no troubles to register comfortable 70-89 win and to end this series in style. 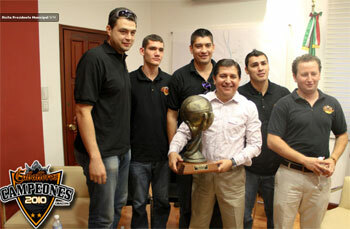 Culiacan had five players with double-digits in scoring. Horacio Llamas (212-C-73) was the leading one with 18 points. Pedro David Meza Rogel (187-G-85, college: Arizona W. CC) and Marcus Moore (198-G-80, college: Washington St.) followed him with 14 points each. Dallas Logan (193-G-82, college: Northwood) (6 as) and Victor Avila (210-C-77, college: Oklahoma) netted 12 and 11 points respectively. In the loosing squad, Franco Harris (183-G-83, college: Boise St.) delivered 15 points. Derek Thomas (193-F-84, college: Appalachian St.) and Letheal Cook (208-C/F-80, college: Bowie St.) combined 28 pts and 11 rebs. Last quarter was the crucial one in this game. Before that, Culiacan made impressive 16-27 in the first period. Cananea shined in the next ten minutes and managed to tie the score at 48-48 (HT). Culiacan improved after the breather jumping to plus 6, but still everything was open before the last quarter. Than, Culiacan demonstrated its power once again, especially in defense. Visitors stopped Cananea to just 5 points in the last ten minutes, while they drained 18 on the other side for excellent 70-89 victory and CIBACOPA title! Cananea, Sonora - The All-Star game for the CIBACOPA was played out on Sunday afternoon as the North Zone faced off with the South. A close game that saw the South winning for much of the contest had the North race back to thrill the home crowd in the 4th. Letheal Cook (208-C/F-80, college: Bowie St.) (Mineros) had 27, Forrest Fisher (193-G-84) (Bomberos) and Blake Walker (196-G/F-82, college: Portland St.) (Fuerza Guinda) had 26 each for the winners. For the South, Louis McCullough (198-G/F-82, college: Francis Marion) (Frayles) had 35, Jesus Lopez (205-F-83, college: SW Baptist) aka Chino (Caballeros) had 26, and Marcus Moore (198-G-80, college: Washington St.) (Caballeros) had 21. The Slam Dunk contest saw home town favorite Derek Thomas (193-F-84, college: Appalachian St.) take the trophy with a windmill 360 that had the crowd on it's feet. While the three point shooting contest had Steve Monreal (180-G, college: Cal.St.-Monterey) (Rayos) take the title. Congratulations to all the participants!